Anxiety disorders are the most common mental illnesses there are. There are six major anxiety disorders that affect some 40 million people in the United States, and some sort of anxiety plagues roughly 20 percent of the population. Of the several anxiety disorders that can be found, obsessive compulsive disorder (OCD anxiety) is one of the more serious. While we’ve all experienced some kind of obsessive thinking with the occasional panicked thought coming around from time to time, actually having OCD is a lot different. OCD can cause some serious anxiety, and the two are actually very closely related. Having a better understanding of both OCD and anxiety can make coping with OCD much easier. Overcoming obsessions and compulsive thoughts and behaviors is absolutely possible; it just takes a little knowledge to learn how to manage it all. Everyone experiences anxiety from time to time. It’s when it’s experienced more often than not when it tends to become a problem. Almost a quarter of all Americans experience anxiety at some point in their lives, but anxiety disorders are different. Having an anxiety disorder can take a serious toll on someone’s life. From feelings of fear that won’t go away to tension, dread, and apprehension, people with anxiety disorders often expect the worst. Being affected by OCD anxiety is very similar. People with OCD (children and adults alike) are consumed with unwanted thoughts that don’t seem to go away. These thoughts turn into obsessions, which frequently make people repeat compulsive actions they believe will help ease the anxiety. Need for things to be orderly, organized, and perfectly arranged. Checking comprises a person checking and rechecking something over and over again (sometimes hundreds of times in a day) to make sure that they are safe. This often involves checking the doors and locks, making sure the stove or oven isn’t on, and verifying that the iron has been turned off or the curling iron unplugged. Someone struggling with OCD may also feel the need to organize and arrange things a certain way. This could include stacking books a certain way, moving items around on a table until they’re “perfectly placed,” making clothes match by color in the closet, and arranging things compulsively in the pantry or kitchen cupboards. Some people with OCD feel the need to wash their hands repeatedly while others think they must perform certain rituals while grooming or bathing. Still others feel the need to clean something in the house a certain way or to be constantly cleaning. Certain mental rituals are often performed. Counting, repeating particular prayers, or constantly finding “good” thoughts to replace the “bad” ones are all common aspects of OCD. OCD affects 2-3% of all children and adults at some point in their lifetime. And, although OCD often starts in childhood, the type of OCD experienced can change over the course of one’s lifetime. Symptoms can range from mild to seriously severe and, if left untreated, can greatly impact wellbeing. If you struggle with OCD, it’s important to learn how to manage your symptoms. Having OCD and anxiety doesn’t have to continue to negatively impact your life. There certainly are ways to manage a chronic anxiety disorder. Aside from medication and psychotherapy, there are things you can do on your own to help manage your OCD and calm anxiety. Recognize What Makes You Anxious. Anxiety is usually triggered by something. Start to recognize what makes you anxious. Is what’s making you anxious based in reality? Are your fears justified? When you begin to become aware of what makes you anxious, you can learn to avoid those situations or overcome unwarranted fears. Accept That You Have OCD. This might be one of the hardest things to do (admitting something is wrong is never easy), but it is definitely one of the best things to do if you have OCD. It makes it so much easier to manage when coming from a place of acceptance. Become More Aware of Your Compulsions, and Begin to Change Them. Whatever your compulsion is, begin to become aware of it. and start to slowly change things. If you must have things perfectly organized, stop when you feel compelled to move something when you think it’s out of place. If you have to check if the door is locked six times, try cutting back to four times and then two. Begin to Make Positive Lifestyle Changes. Lifestyle has a lot to do with the anxiety you experience. 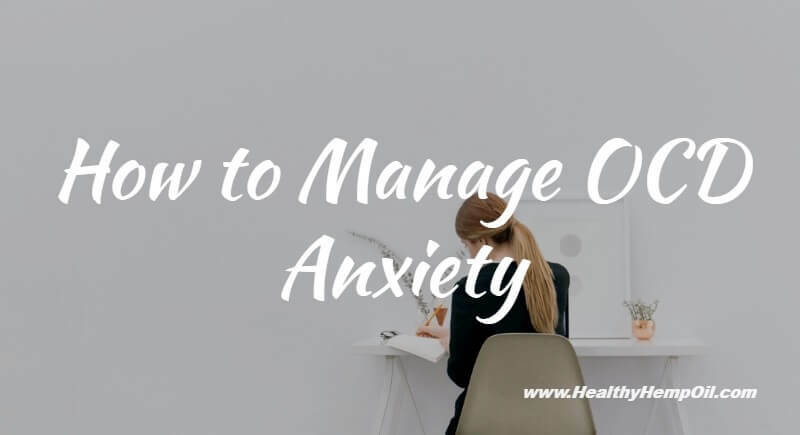 Making sure to eat a well-balanced diet, getting plenty of exercise, spending time with loved ones, and having a healthy social life are all beneficial to decreasing anxiety and managing OCD. Getting plenty of sleep and practicing relaxation methods are also helpful OCD management tools. When you know how to better manage it, OCD anxiety doesn’t have to continue to control your life. Becoming aware of what causes your anxiety is the first step. Once you know what’s triggering the anxious episodes you experience, you can get a better handle on how to go about changing things. Do you have OCD? Have you found any methods that have helped you better manage your symptoms and live with less anxiety? If so, we’d love to hear about it in the comments below!